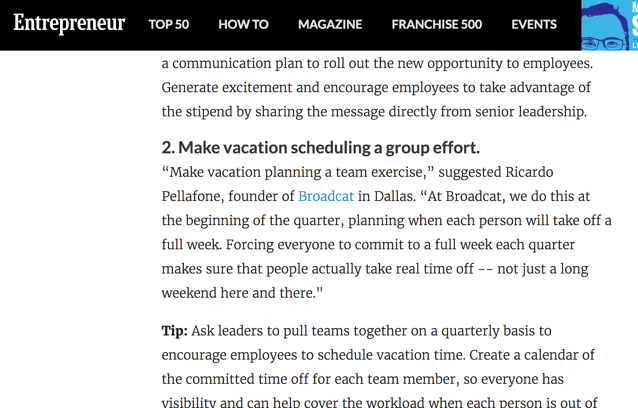 Enough so that our vacation practices were recently included in a feature in Entrepreneur (hat tip: Heather Huhman). So, we thought we’d walk through what we do, how we do it, and why—and why you should do something similar for your compliance team, too. Quick note: this will apply to anyone whose job involves a lot of decisions. But I'm focusing on corporate compliance as an example because (1) that's who we work with and (2) compliance teams have a particularly nasty workload in this respect. 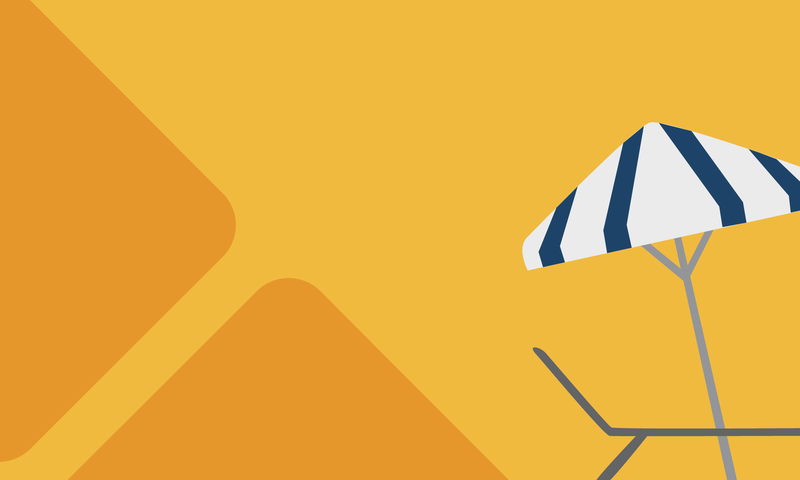 Officially, we do the standard “unlimited vacation” startup thing. That’s our policy. And that is great in theory. But it's easy for “unlimited vacation” to end up meaning “no vacation” due to pressure to perform. You can find articles critical of these policies for exactly that reason. Because just like with any compliance policy, what the policy says doesn’t matter—it’s what people actually do, and it’s easy for “unlimited vacation” to turn into fewer days off than before. To make sure we didn’t fall into that trap, we decided to make it our practice that everyone takes off one full week per quarter. Not “5 days in aggregate,” but a full, contiguous week. We treat this as the minimum time off. Because life happens, and business needs fluctuate, and we take other holidays off too. So all in, the average Broadcat should get 6-7 weeks off per year. We just need to be able to get in touch with you in case we can’t find something, and it’s your responsibility to make sure another team member knows where all your projects are so we don’t have to do that. And so far, we haven’t. How we pull this off. We get together at the beginning of the quarter and map this out. We figure out who can’t be out at the same time, and then we set a deadline for everyone to get their time in. 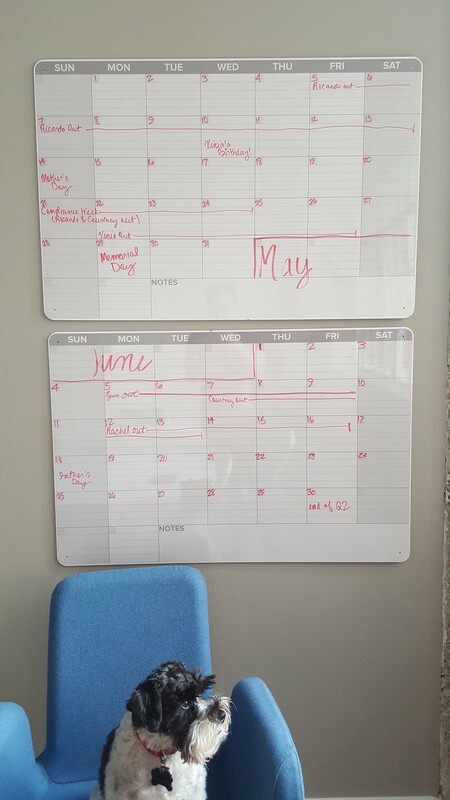 We then put this into our shared calendar, as well as on some whiteboard calendars we keep in the office. Also shown: office dog, being pensive. Doing this at the beginning of the quarter is hard, but important. That's because part of the reason it can be tough to take vacation is that there's never a "good" time to take it. And that leads to problems, because by the time you realize you need one you're probably pushing burnout. So, we set the standard that you get your time in early, and we just work that into our bandwidth and project planning. That's how we operationalize our policy. Why we do it—and you should, too. There are a ton of reasons why we do this. It helps with recruiting, because no one likes feeling guilty about taking vacation. And it helps with retention, because no one burns out. And it’s a fraud control, because it’s really hard to get a secret scheme going if you’ve got to hand your work off to someone else once a quarter. And it is consistent with how I view my role as an employer, because I’m Christian and the Bible is fairly clear on treating workers like "human beings" instead of "assets to be bled dry." But let me go deep into just one reason that goes to not only why we do it, but why you should adopt it for your compliance team—even if it’s just as an informal thing. Because your team has to make smart, fast decisions. 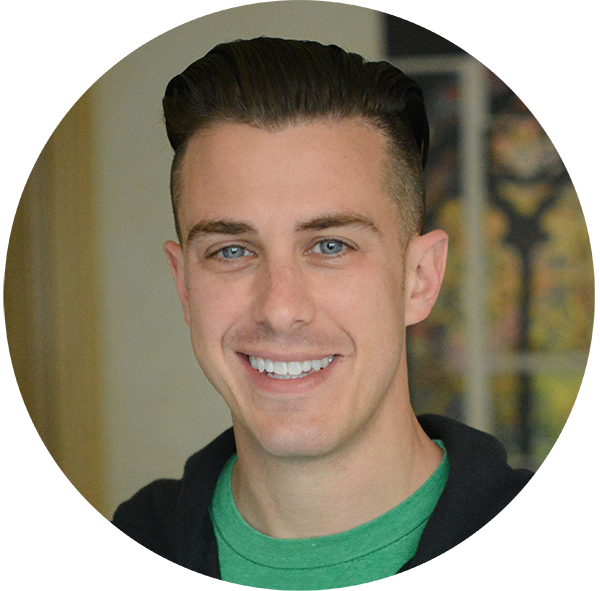 Realistically, your team is probably like ours: small, with a big mandate, and constantly dealing with must-do, reactive tasks that come at you left and right. Smart, fast decision-making is how you triage the reactive stuff that comes at you so that you can focus on things that have strategic value. Your team’s impact will really depend on whether they can consistently do this. Otherwise you end up just running from fire to fire without making any progress. The more decisions you make, the worse you get at making them. This is the concept of decision fatigue; this New York Times article does a nice job of explaining it. And it puts you in a position where your team has to make a lot of decisions, but will get progressively worse at making them. The science in the Times article talks about how this happens during the day; my anecdotal experience is that there's a cumulative effect too. So, to avoid having my team make bad decisions—or just straight-up stop making decisions at all—I figured I could try one of two things. #1. Give them a bunch of mindless busy work to help them balance the load of decision-making. #2: Keep them focused on high-value decision-making and have everyone regularly take time off to recharge. The second option was a better use of resources; you can outsource or automate busy work for much less than having it done by a full-time employee with benefits. So that’s what we do, and we think it would apply to you, too. Let's close with two practical issues. #1: How do you stop someone from exploiting this and taking six months off? But that's not really a policy problem; that's a recruiting and management problem. If the only thing that keeps someone consistently showing up to work is your attendance policy, you don't have a great attendance policy—you have an employee that's either a poor fit or poorly managed. You fix that through coaching or a severance package. #2: What's the magic of 1 week/quarter? It's easy to understand and implement. That's it. Because does "fighting cumulative decision fatigue" necessarily mean taking off 1 contiguous week/quarter? All of the vacation data I've seen is just about how people are taking less of it and it's bad, but not what the right amount of time is. So I'm not saying this is a real bottoms-up, data-driven practice. This is blue sky stuff to the best of my knowledge. What I am saying is that 1 week/quarter is an easy concept to grasp and implement. And I want my team spending their energy thinking about the compliance and design problems we're trying to solve, not trying to figure out some complicated vacation accrual scheme. So don’t get hung up on the specifics if talking about a full week versus two long weekends starts to turn this into a corporate subcommittee on vacation scheduling. Just make a decision and do something to get your people to take serious rest and stay nimble—instead of staggering along at half-capacity because they're hoarding all their vacation days for when they quit.